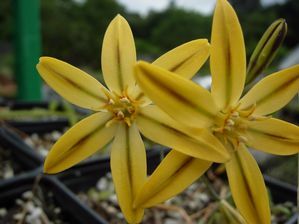 You will also see this plant referred to by its former botanical name of Brodiaea ixioides. 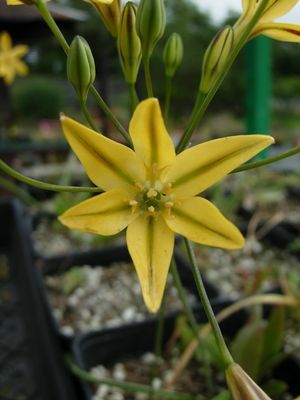 Pretty face or golden brodiaea is a California native that grows from corms (bulb-like structures). It has slender grass-like leaves and in late spring to early summer puts out a flower stalk that can grow to 2' tall. The flowers are about 1" across and bright golden yellow with a purple-black mid-rib and veins. Plant in a sunny location and allow the soil around the corms to dry out during the summer. The leaves will die back after the plant has finished blooming and the plant will then go dormant until the winter rains start again.